When city life gets too much, and you want to escape to natural surroundings, consider heading for Taputeranga. At just 6km away from Wellington, Taputeranga is within easy reach of the city centre. In fact, you don’t even need your own boat or car to get there, as buses run regular services to the area. 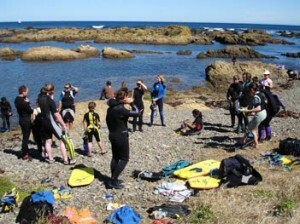 What Can you do at Taputeranga? Thanks to the ease of access, Taputeranga is one of New Zealand’s busiest Marine Reserves. This coastal gem is ideal for nature lovers of all ages, and there are some calm and shallow waters for children to go snorkelling in. You can walk to the Island Bay snorkel trail from the Island Bay bus stop within a matter of minutes. While there, you have the chance to meander between rocks to see shallow water sea life. If shipwreck exploration appeals to you, make your way over to the F69 Wellington frigate, which has been marooned there since 2005. If you are planning to head onto the water, you might see some whales. Other large marine life frequent the area too, which means it is just as good for scuba diving as it is snorkelling. If you do choose to take a boat out, you must adhere to one simple rule: no fishing. In fact, the Department of Conservation has a dedicated phone number for visitors to call if they see anyone taking marine life, rocks, or other naturally occurring inanimate objects away from the reserve. The same goes for anybody who is littering or dumping toxic waste into the reserve. Naturally, you may want to learn more about why conservation is so important in the area. This is one of the Marine Reserves that features an interactive education centre. Go to 212 The Esplanade to learn more about the area, its history, and why conservation there is important. If you would like the chance to get up close to aquatic life without going in the water, you can also visit the reserve’s aquarium. There is no denying that Taputeranga ranks highly amongst all the Marine Reserves when it comes to accessibility. If you wish to travel by car, you only need to drive 6km away from Wellington’s city centre to do so. You can travel to three of the bays by bus: Island Bay, Houghton Bay, and nearby Lyall Bay. The DOC welcomes boaters. Both Island Bay and Owhiro Bay have ramps, but it is advisable to obtain up-to-date marine forecasts before setting off. This part of Wellington is prone to weather changing at the last minute, so don’t rely on a forecast you’ve obtained well in advance of your trip. Fortunately, boaters can navigate their way to the eastern and western portions of the area using the bright yellow beakers close to the shore. In contrast, outer boundaries have no buoy markings. This means taking a map or using GPS is advisable. There are no designated camping areas at this Marine Reserve. However, as Wellington is such a short drive away, it is possible to stay in the city centre and reach Taputeranga easily. If you are craving peace and quiet, it is possible to find campsites in the outer areas of Wellington. However, you may find that you need a car to reach the reserve, unless you are willing to complete the cliff walk. Visiting Taputeranga is ideal for anybody who wants to experience a day at a Marine Reserve, without having to travel too far. Whether you already live in Wellington or you are on holiday there, this is an area of natural beauty you simply cannot miss.